Ohai a short update on my weekend outfit! As promise I been wearing jeans outfit recently and this is the another pair of jeans which I really like. I like how it can prolong my body proportion and it was high waisted too. When I first saw the model wear the jeans, I was definitely feeling to own these jeans for myself. But upon receiving this pair of jeans, I was not liking it due to its cutting and make me looks shorter after wearing it. But after I try and create a fun outfit with this jeans. I straight away fall in love with this pair of jeans! Read more to see more outfit details. Today was all blue outfit with my new baby blue off shoulder top again. I love this top is because of it's unique design where it comes with super cute knot where you can tie on your shoulder. Blue is one my kind color too! I don't look slim at all is just that I know how to hide my fat with my outfit. My belly fat is not good to disclose and I'm not active in Sports too. Wait I am ashamed of myself now. Due to busy working life and blogging, I have no time to exercise or hit any gym near my house too. 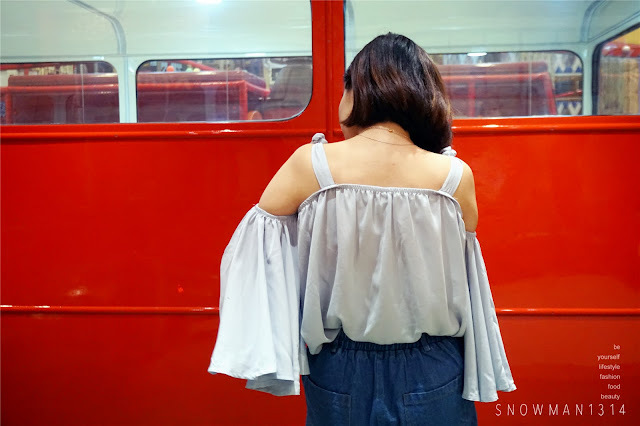 So the CHEAT way is to cover your fats with your outfit when you are heading out. Oh, wait! The two knots are actually are not tie-able since they sew the knots together. But after I wear it still look loose for me, hence I re-tie the two knots again to the way I feel safer and comfy with it. Where both of the sleeves are pretty secure to your arms since it came in tube elastic design. The material was in chiffon and super comfy to wear! The color is pretty close similar to the color in the picture. Super harmony and comfy color combination to look at. Jeans details! Comes with two big pockets in front where I can put my handphone or small accessories inside. Love the cute little frills design on the bottom too. It's the mid-week now and we one month more till Christmas! I hope you guys enjoy reading my weekend outfit post on the mid-week. 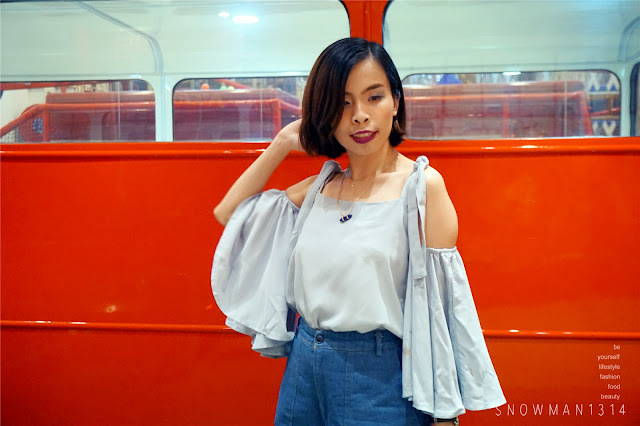 I feel that we always feel stress during weekdays after work and for me update my weekend outfit is the best way to stay update and communicate with my readers! Yes! You're so right! Even if we have tummy, it can cover. Haha. Saves us when we want to et a lot. LOL! Love it! Wow! Absolutely gorgeous outfit. I love this combo of double blue. The top is too cute! Yes, its a tricky jean cut to style but you've nailed it! Another winning combo from you. I don't think you look short at all wearing the jeans. I love the top too, although that's not my kind of style. Hey! The background is at Parenthood Sunway Pyramid! nice color! The baby blue off shoulder top suit you well. love your fashion sense. OMG i really love your outfit. Its so 70's like.